The character of the Moraira area coastline, with its cliffs and dramatic headlands means that the beaches are mainly in small coves and bays. The Main Moraira Village Beach, Playa la Ampolla is quite large large and safe for children, as it shelves quite steeply and is generally protected from big waves. The beach is well served by bars, restaurants etc, there are public toilets, showers and a lifeguard during the summer season. Moraira has another beach at el Portet which is not as large as the Moraira Villa Beach but is more closely protected by the headland and one side and the Moraira Marina on the other. It has very soft sand and again shelves gently, being ideal for children. Both beaches are served by beach bars and restaurants which are open until around midnight, and serve drinks, snacks and main meals. There are many other coves and bays along the coast with sandy or sand/rock beaches, all of which are well worth exploring. No Spanish beach would be complete without its beach bar, Chirinquito and Moraira beaches have their share. They provide sandwiches, hamburgers, tapas, platos combinados, "beach" music - and, of course, ice creams and cool drinks! A recent law provides for marker buoys to separate sailing- and power-boats from bathers. Bathers, as well a sailors, are expected to observe these limitations and there are heavy fines for non-compliance. Most Moraira area beaches have a lifeguard tower and this has a flag at the top which is either green, yellow or red. The meaning is obvious and it is best to take notice. There is practically no tide in the Mediterranean but often strong lateral currents. It might seem fun to body-surf when there are large waves but the undertow and moving bottom on a sandy beach can makes this quite dangerous even for strong swimmers. 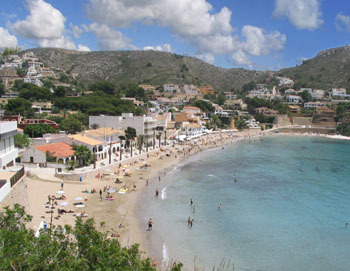 CLICK HERE for the Moraira Beach Map.